Jeremy Renner Remembers That He Can Actually Act in "Kill the Messenger"
Kill the Messenger begins with footage of Richard Nixon calling drugs "public enemy No. 1," followed by clips of subsequent presidents reaffirming their commitment to eradicating the foe. This is all a prelude to the film&apos;s soberingly ironic subject matter: the C.I.A.&apos;s complicity in selling crack cocaine in the 1980s (funneling the money to anti-communist efforts in Nicaragua), followed by the U.S. government&apos;s predictable efforts to discredit a journalist who exposed the scheme. Our Woodward and/or Bernstein is Gary Webb (played by an unflatteringly facial-haired Jeremy Renner), an investigative reporter for the San Jose Mercury News working out of the paper&apos;s Sacramento bureau. In the course of covering federal trials related to the disastrously wasteful War on Drugs, Gary comes into possession of a grand jury transcript that sends him down a rabbit hole of C.I.A. shenanigans, obfuscation, and chicanery. Basically, when crack was hitting the streets in the &apos;80s, the C.I.A. at least turned a blind eye from, but probably actually helped, the Nicaraguan drug traffickers who brought it, because the money was going to the Contras. Gary&apos;s editors (played by Mary Elizabeth Winstead and Oliver Platt), like all good newspaper editors, are skeptical, dead-set against getting a story wrong. All of Gary&apos;s sources are drug traffickers and other criminals who claim to have made deals with the C.I.A. (which of course won&apos;t comment). The Mercury News, a medium-size daily, doesn&apos;t have much experience in breaking major national stories. And two papers that do, the L.A. Times and the Washington Post, are quick to scrutinize the story as it unfolds on the pages of the Mercury News (and online—this, in August 1996, was one of the first instances of a newspaper using its website to spread a story beyond its usual reach). The Times arrogantly assumes that if the story were legit, one of its own reporters would have broken it, while the Washington Post is too sympathetic to the C.I.A. to be objective. And the C.I.A. is more than happy publicize anything it can find on Gary Webb that might make him seem unreliable. At home, Gary&apos;s wife, Sue (Rosemarie DeWitt), is thrilled for the professional success he&apos;s having, but worried about the repercussions that pursuing such a deep story may have on her and their three kids. (I don&apos;t remember if anyone in the film actually says the line, "You have no idea what you&apos;re getting into," but it&apos;s definitely implied.) There are references to something that happened "in Ohio," before the family moved to California. The wives and children of men unraveling mysteries that go straight to the top often don&apos;t have much to do in these movies, and that&apos;s generally true here. But Dewitt has a fierce presence that makes her hard to forget, and Lucas Hedges has one particularly well-calibrated emotional scene as Webb&apos;s teenage son. The film unfolds carefully, like a journalistic mystery thriller, with Gary chasing the story to Nicaragua and back as deeply concealed sources reveal crucial details. A parade of recognizable actors—including Andy Garcia, Ray Liotta, Barry Pepper, Michael Sheen, and Michael K. Williams—appear for one or two juicy scenes each and then vanish as the narrative moves past their characters&apos; usefulness. (No sentimentality here.) It was directed with tense skill by Michael Cuesta, who&apos;s executive-produced TV shows like Homeland and Dexter, and written by Peter Landesman, a real-life journalist whose other screenplays, Trade and Parkland, are about human trafficking and the JFK assassination, respectively. 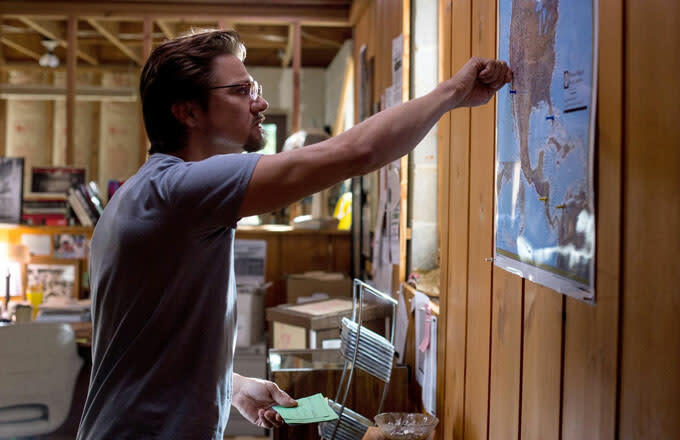 Kill the Messenger is serious-minded (though not dour; there are humorous moments), demonstrating a passion for the true story without being strident. As sometimes happens with true stories, however, this one is anticlimactic. The events that might have served as climax in another telling of the tale (one that was more biopic than journalism) are here relegated to end-of-movie title cards. These are accompanied by more news clips of government officials admitting a few things but denying most of them, including the now-famous statement from former C.I.A. officer Duane Clarridge: "There has never been a conspiracy in this country!" (This was several years after Clarridge himself was indicted for his role in the Iran-Contra affair, which, um, apparently was not a conspiracy.) Gary Webb and his career were mere collateral damage in an apolitically tragic drama about a David whose Goliath might be too big to defeat. Eric Snider is a contributing writer and film critic. He tweets here.